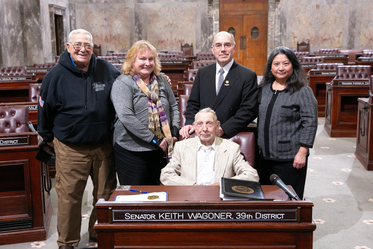 I was honored to be joined by my friends George Wolner and Tina Champeaux, my father Les and my wife Wen on the first day of the 2019 Legislative Session. Greetings! Thank you for taking time to read my newsletter about the start of the 2019 legislative session. As your state senator, it is important to me that I am representing you well in Olympia. For those who do not know me, my family and I have lived in the 39th Legislative District for nearly all of my life. Raised on a goat farm in Alger, I was the first in my family of five to attend college, graduating from the Naval Academy in Annapolis. I have served our country as a Naval Officer and pilot for over 20 years and hold a master’s degree in Global Leadership, and previously served as the mayor of Sedro-Woolley. Appointed to serve as your state senator in January 2018, I was elected to keep serving you this past November. This session my committee assignments include the Senate Early Learning and K-12 Education Committee and Ways and Means Committee. I will also be serving as the Republican lead on the newly formed Behavioral Health Subcommittee. 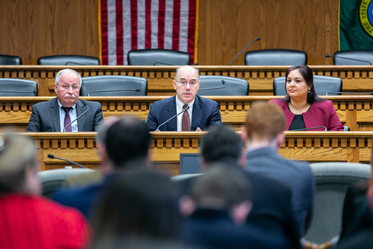 This subcommittee will take a closer look at improving Washington state’s mental health care system and how we can better help some of our most vulnerable citizens (see more below on this subject). It is an honor to now serve you as your state senator. Please take a moment to read about some of the work I am doing at the state Capitol on your behalf. Don’t hesitate to reach out to my office with any questions or concerns you may have about your state government. I am here to serve you. AP Legislative Preview panel on mental health. Washington’s mental health system is in crisis. Too many of our most vulnerable citizens are suffering with mental illness and substance addictions due to the lack of community behavioral health services. These barriers prevent patients from receiving the care they desperately need. In recent years, the Legislature's focus point was appropriately on fully funding education. Now it is time for lawmakers to provide that same level of attention and commitment to improving and reforming our mental health and addiction recovery systems. We must ensure that our mentally ill get the treatment they need and deserve. Last week I had the privilege to speak about this issue on a panel of legislators gathered to talk to the media about what we can do this session to better address our citizens with behavioral health needs. My caucus has been working on this issue since before the session began and is tackling this issue head on. To learn more, watch on the video. This week the governor gave his State of the State address in which he talked about his plans for Washington state. I was asked by Q13 news about his proposals and investments in mental health. Watch the video to hear my response.